More than a decade earlier, in 1937, a lesser known young patriot in Bangalore, brimming with national pride, dropped to the ground loudly beckoning, "Hare Rama." He was critically injured while participating in a freedom movement protest gathered at the City Market area when the police forces started using lethal weapons during the British rule. Profusely bleeding, the innocent man's call to the Almighty was a scene that often haunted the 13-year-old S.V. Narayanaswamy Rao, who had then witnessed this episode at alarmingly close quarters. At first, teenager Narayanaswamy felt shattered and helpless. But as he gradually regained his balance to accept the harsh realities of life, his resolution to bring harmony amongst the people was further cemented with a promise to Lord Rama that he would work towards cultural unity through bhakthi, and ingrain harmony in people through melody. An adherent worshiper of lord Rama, S.V.N Rao was inspired by Saints like Rama Dasa & Thyagaraja, who turned Rama Bhakti into musical marvels. Like the great Bhadrachala Rama Dasa, S.V.N dedicated his life serving lord Rama. Having hailed from a traditional Madhwa Deshasta family, Narayanaswamy Rao surrendered himself to the lotus feet of lord Rama. 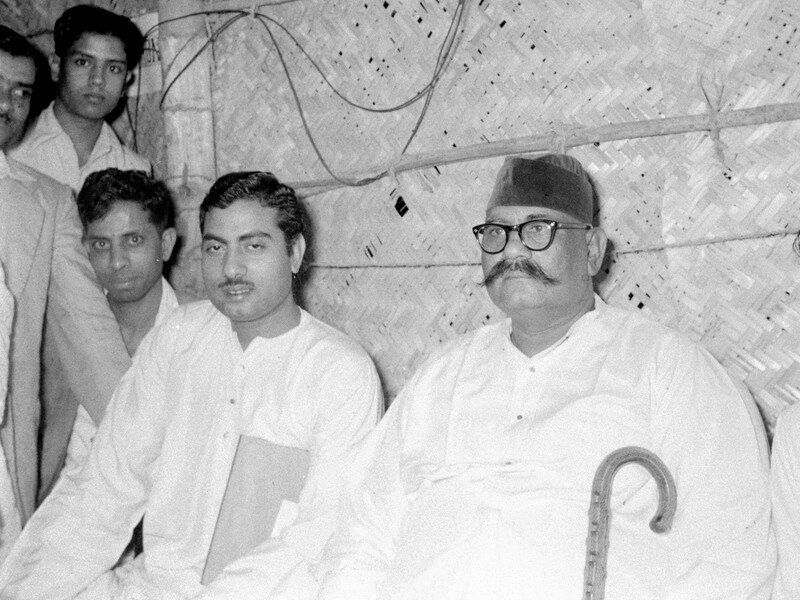 Sri Narayanaswamy Rao, then just a boy of fourteen years, was inspired from Bal Gangadhar Tilak's idea of celebrating Ganapathy festival & started organizing Holi & Ganesha festivals in his locality, true to his age, he and his friends must have enjoyed this as fun, but one could notice an element of religious fervor and Devotion to music underneath. After the first series of festivals were over, surplus money accrued from the funds collected. Wondering how to utilise this Mr. Rao hit upon the idea of celebrating Ramanavami in the coming year, thus in the year 1939, almost by a divine urge Narayanaswamy Rao started the Ramanavami festival. In the beginning, all the activities during the Ramanavami took place before a painting of Rama Parivar. As the organisation grew bigger, a beautiful wooden Mantap was used to place the painting. The painting of Rama Parivar was replaced by a silver portrait and the wooden Mantap was replaced by a silver one. In the late 60's Narayanaswamy Rao got a divine urge to make Panchaloha idols of lord Rama, Seetha, Lakshmana & Hanuman. He traveled daily for 2 years to Shivarapatna and got made the beautiful panchaloha idols. He also got made a beautiful 10 feet brass mantap to house the idols. The idols along with the Mantap were first displayed during the 25th Sree Ramanavami Celebrations. The splendor and grace of the bedecked idols in the background at the celebrations brings in a revered sanctity to the massive open-air pandal at Fort High School grounds venue. Hindustani exponent Pandit Rajan Mishra (of brothers Rajan & Sajan Mishra) had commented, "Both of us enjoy singing here, not just for its prestigious banner but because it offers a Spiritual Platform." The Hanuman logo used by the Mandali cannot be seen anywhere in the world because it was designed by Narayanaswamy Rao himself as per the image of hanuman that had appeared in his dream. In fact it is said that a monkey had released the Souvenir before the Inauguration function of Mandali's Golden Jubilee year by His Excellency, R Venkataraman, The President of India. He spent almost 6 hours decorating and worshiping the lord. Like Rama Dasa of Bhadrachala, this devotee of Rama too wrote the divine name of lord Rama for 10 million times. He religiously read Sundarakanda and at times he would become very emotional. He had very good relationship with many pontiffs like Sri Vidya Manya Theertha, Sri Vidya Prasanna Theertha, Sri Vidya Payonidhi Theertha, Sri Satya Pramodha Theertha, Sri Vishveshwara Theertha to name a few. He shared a very strong bond with Sri Vidya Manya Theertha of Palimaru Mutt. He was a great devotee of Raghavendra Swami & Vijaya Dasaru and used to visit Mantralaya every year in the month of November, just before he started booking artistes for the Ramanavami celebrations. In fact, he always gave the Mantralaya Prasadam to artistes with a token advance of Rs.20/-. S.V.N Rao got made a statue of Raghavendra Swamy along with a beautiful rose wood Mantap to house it. He was deeply in love with the Supreme Lord. His entire body, mind, words and actions were dedicated to the service of Lord Rama. He liked only to hear and speak about topics relating to Rama; he did not eat anything which was not offered to lord Rama; indeed through his words, thoughts and deeds S.V.N Rao was the embodiment of one deeply in love with the supreme object of love, lord Rama. Such a devotee could not live for a second without being in touch or serving the lord Rama - Supreme Entity. Being the son of a police officer, he often participated in freedom movements that shaped him into thinking that festival congregations would provide people the right platform for deliberations on the Lord. And prayer along with cultural proceedings brought in a commonality of purpose. The rationale was not just to get across the religious outpourings, but to have a sense of reason and principle towards the propagation of our bhakthi, culture and music for united India. S.V.Narayanaswamy Rao conducted at least 10 Ramanavami Festivals during the British Raj. 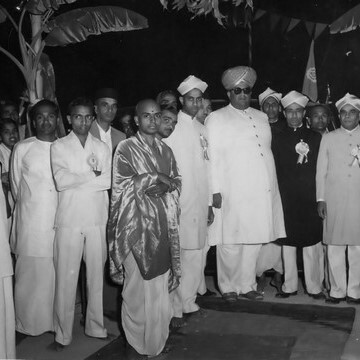 He successfully organised Ramanavami Celebrations even at the time of Emergency. During 75 years of his life Narayanaswamy Rao, faced many threats but his determination to Protect & lead Sree Ramaseva Mandali made him to overcome them. Some people even made a failed attempt to remove him from the organization he had established. He in a way challenged the very foundation of materialism. He dared to sacrifice his education & carrier for the sake of Ramanavami. Only Ramanavami mattered to him. He was a person of high integrity. The classical music in Bangalore did not receive that much financial patronage as compared to patronage for classical music in Chennai. So fearless was Narayanaswamy Rao that, at times he had to start the celebrations without a single rupee in hand. Whatever may be the difficulties he never compromised on the quality, which has made the Mandali, what it is today. II Yatra Dharmaha Tatra Jayaha II "Where there is righteousness there will be victory". He won all the challenges because of his righteousness. He led a life of true fearless yogi. 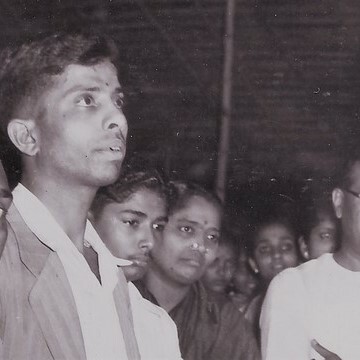 At the age of 14, Narayanaswamy Rao created a revolution by combining spirituality with music. He was the first person to organize a music festival as part of Ramanavami Celebrations, which predominantly consisted of religious activities. READ MORE..
At the age of 14, Narayanaswamy Rao created a revolution by combining spirituality with music. He was the first person to organize a music festival as part of Ramanavami Celebrations, which predominantly consisted of religious activities. His Highness Sri Jayachamaraja Wodeyar called Mandali as II Gnana Gana Sudha II & admired, Narayanaswamy Rao's model of Ramanavami Celebration in which various religious activities is organised in the day time and cultural activities in the evening. Classical music festival across the country starched for a period of 3 – 15 days. S.V.N Rao revolutionized classical music by conducting it for a period of 48 days. In fact the golden jubilee of the Mandali & diamond jubilee of the Mandali was celebrated with 54 & 64 days concert series. Before Narayanaswamy Rao, Indian classical music was an Indoor activity i.e it was either organised in temples or in small halls, which could accommodate around 1000 people. By conducting his Ramanavami celebrations in huge open Pandal, Narayanaswamy Rao brought a revolution by taking classical music to the masses. 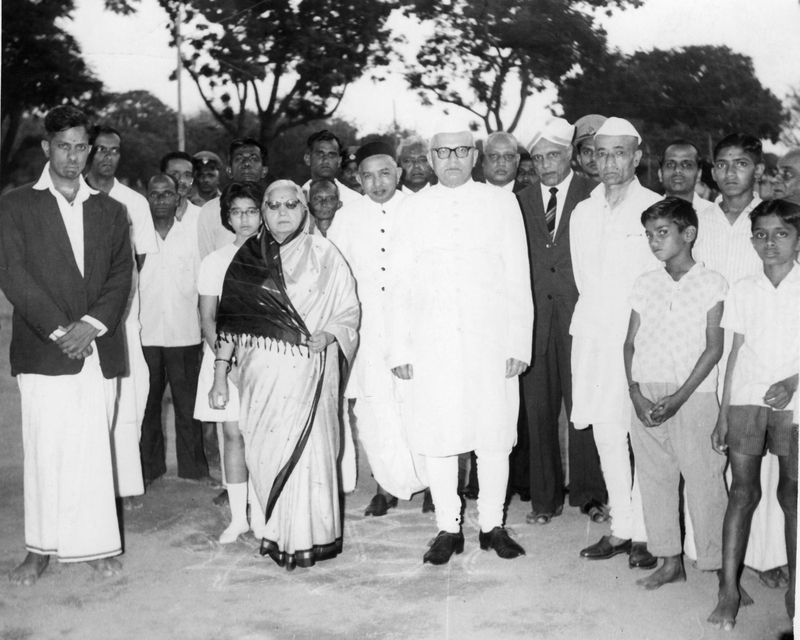 C.Rajagopalachari the first Governor General of India appreciated S.V.N.Rao for this and asked him to continue the same. He further referred Mandali as 'The Temple of Music'. Narayanaswamy Rao & the Mandali have a greater share in ensuring that the essence of Indian Classical Music exists in Karnataka in the era of westernization, that's the reason why people call him a MUSICAL PHENOMENON. 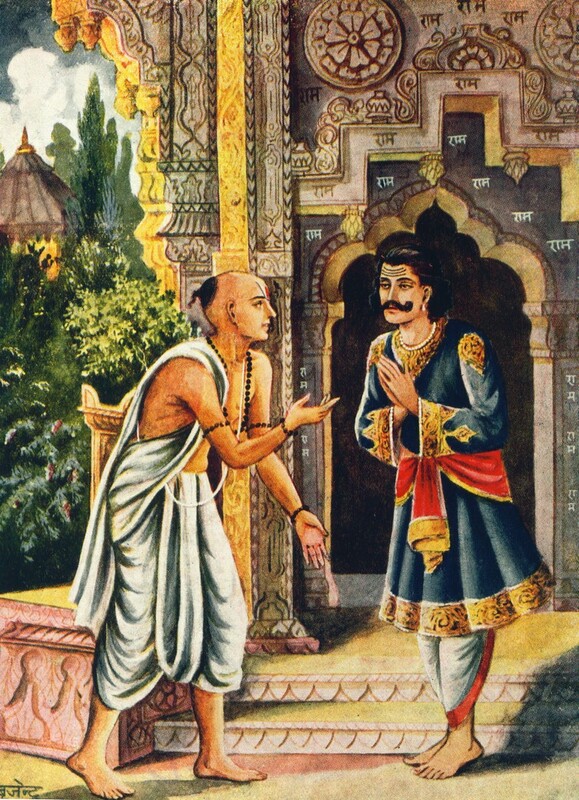 Bantu reeti kolu viyavayya rama….(Oh! Rama let me be your guard and stay close to your divine company). Lord Rama himself must be proud to have such a committed devotee in a gem like SVN. Indian Classical Music is a holy river originating from the Mountain of Bhakti. On the other hand Lord Rama is a mighty ocean of idealness. The Indian culture gets a gift every time the river meets the ocean. From lord Hanuman to Kusha & Lava, From Bhadrachala Ramadas to Tulasi Das, From Saint Raghavendra Swamy to Saint Sri Tyagaraja swamy. One such gift was bestowed by the lord on 21st December 1924. S.V.Narayanaswamy Rao, the pioneer of Ramanavami music in Bangalore was born on that date. Sri S.V.N Rao turned his devotion to Rama into his love for Indian classical music and gifted the world a festival that has become an icon of Indian culture. At the mere age of 14, he started a cultural revolution, which he named 'Sree Ramaseva Mandali'. His devotion, simplicity, dedication and fearlessness made people to call Mandali 'The Temple of Music'. 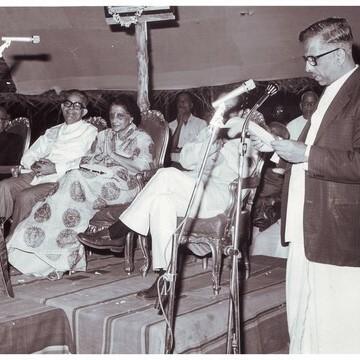 After having created a revolution in the way concert series of Indian Classical music was organised, S.V.Narayanaswamy Rao wanted to create a revolution in the way Music was taught. But before fulfilling his dream, S.V.Narayanaswamy Rao departed from this materialistic world on 5th January 2000 at the age of 75. In the year 2000, the Government of Karnataka named 2nd cross of Chamarajapet after S.V.Narayanaswamy Rao. With an intention of spreading awareness about the life of this cultural phenomenon & to fulfill the dreams of S.V.Narayanaswamy Rao a foundation in his name dedicated to the field of Education & teaching of various forms of World Music was established on 23rd September. Narayanaswamy Rao always preached and practiced that all humans were the offspring's of the supreme entity Sree Ramachandra. Saleh Ahmed a Muslim company with Christian manager is supplying the chairs for the Ramanavami Celebrations from the past 5 decades. Sri S V Narayanaswamy Rao shared a special bonding with artistes like Ustad Bade Gulam Ali Khan, Ustad Akbar Ali Khan, Ustab Bismillah Khan, Ustad Amjad Ali Khan, John B Higgins, Dr.K.J.Yesudas, Begam Parveen Sulthana to name a few. All the above named artistes were very particular of obtaining Prasada of lord Rama before and after the concert. READ MORE..
Narayanaswamy Rao always preached and practiced that all humans were the offspring's of the supreme entity Sree Ramachandra. Saleh Ahmed a Muslim company with Christian manager is supplying the chairs for the Ramanavami Celebrations from the past 5 decades. 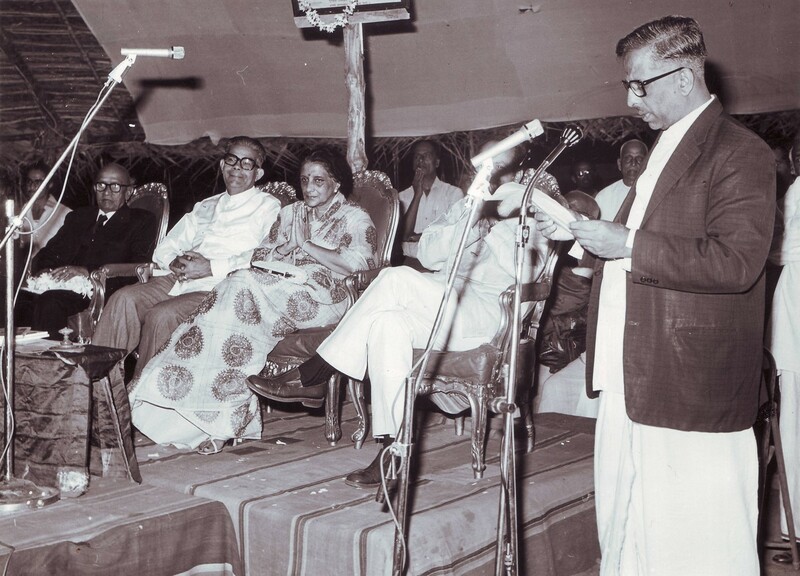 Sri S V Narayanaswamy Rao shared a special bonding with artistes like Ustad Bade Gulam Ali Khan, Ustad Akbar Ali Khan, Ustab Bismillah Khan, Ustad Amjad Ali Khan, John B Higgins, Dr.K.J.Yesudas, Begam Parveen Sulthana to name a few. All the above named artistes were very particular of obtaining Prasada of lord Rama before and after the concert. In late 70's before the concert of Ustad Bismillah Khan, there was a heavy shower which had harmed the coconut fronds Pandal of the celebrations, which forced Narayanaswamy Rao to cancel Bismillah Khan's programme. 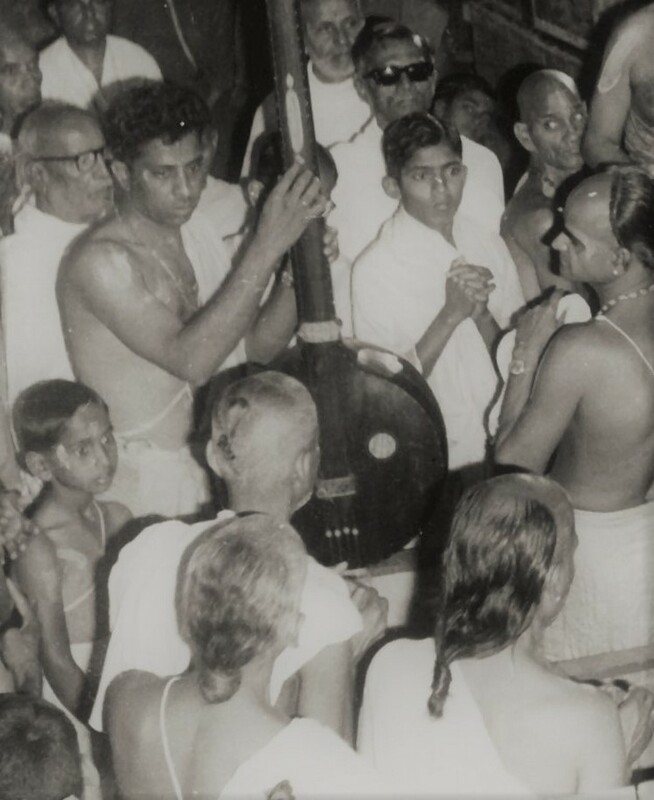 But after seeing lord Rama at the Mandali and after having heard about Sri S V Narayanaswamy Rao contribution to Music, Bismillah khan said that he wants to perform before the lord at any cost. He stayed in Bangalore for one week and performed in the Celebrations. On Ramanavami day, Sri S V Narayanaswamy Rao made sure that all people irrespective of caste & religion get the Panaka (lime juice) and Kosambari (Salad made out of pulses). He only believed in the religion of Music, which made him a great soul. 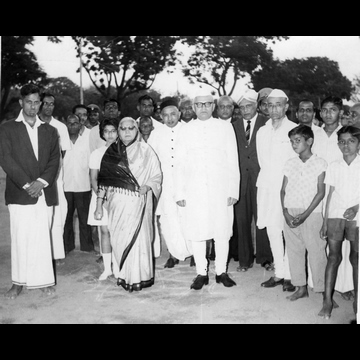 1964 had a massive impact on the life of SVN Rao & Sree Ramaseva Mandali. Firstly after having made beautiful panchaloha idols of lord Rama, Sri S V Narayanaswamy Rao decided to make a Brass mantap to house the idols. 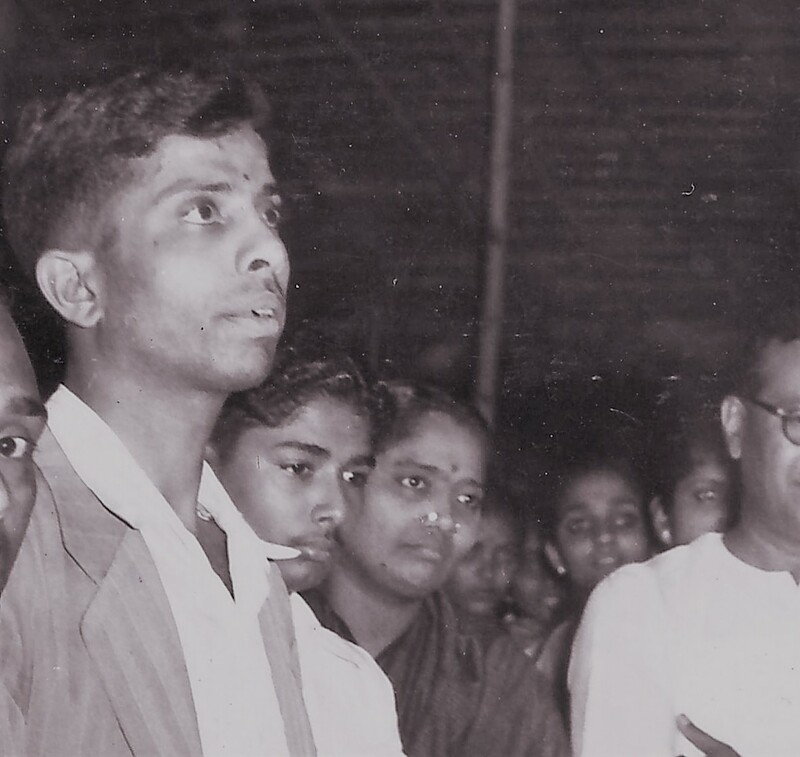 READ MORE..
1964 had a massive impact on the life of SVN Rao & Sree Ramaseva Mandali. Firstly after having made beautiful panchaloha idols of lord Rama, Sri S V Narayanaswamy Rao decided to make a Brass mantap to house the idols. The work started in the year 1963 and the Mantap was offered to lord Rama in the Ramanavami celebrations of 1964 by His Holiness Sri 108 Sri Sri Vidya Manya Theertharu. The brass mantap at the Mandali is a magnified replica of a silver mantap with the Maharaja's of Mysore. This is the reason one can see the Gandaberunda logo of the Wodeyar dynasty on the Mandali's Mantap. Another important event that took place in the year 1964 was the change of Ramanavami celebration's venue from City institute compound to the Old fort high school grounds. 'Fort high school grounds' has become a synonym to the Mandali's Ramanavami Celebrations. Sri S V Narayanaswamy Rao has played a major role in the all round development of the school and the Mandali has even adopted the high school division. Over 7500 artistes have participated in the Ramanavami celebrations at fort high school grounds and over a crore people have rejuvenated themselves at this venue. The moment lord Rama is brought inside the specially erected pandal every year the venue transforms into "The Temple of Music". SVN Rao was very traditional and he had made it a custom to visit Varadaraja swamy temple at Kanchipuram while coming back from Chennai every year in the month of December. During such visit to Kanchi Varadaraja Swamy temple in the year 1963, a holy man, whom SVN had never met came to the Narayanaswamy Couple and said that you will have a son who will succeed you in the service of Rama and instructed Narayanaswamy Rao to name his son after Varadaraj Swamy the lord of Kanchi. In the year 1964, Sri S V Narayanaswamy Rao was blessed with a baby boy & was named Varadaraj as per the instruction of the holy man. S.N.Varadaraj in the year 2000 succeeded Sri S V Narayanaswamy Rao in the service of lord Rama. logo of the Mandali as per the image he had seen in his dreams. Narayanaswamy Rao hailed from a Madhva Deshasta family belonging to Vashista Gotra. His ancestors hailed from Maharashtra but had settled in sculpture city of Shivarapatna in Kolar district. It is said that Balaji Rao the Great Grandfather of S.V.Narayanaswamy Rao migrated from Tuljapur region of Maharastra & settled in Shivarapatna. Venkob Rao was the son of Balaji Rao. 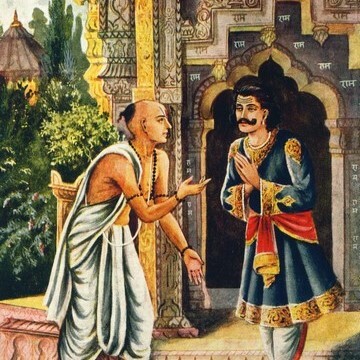 Vasudev Rao was the son of Venkob Rao. Vasudev Rao was a Police officer and he migrated from Shivarapatna and settled in Bangalore the IT capital of India. Vasudev Rao married Janaki Bhai, who belonged to a family of Deshpandes and had 3 sons and 2 daughters. S.V.Narayanaswamy Rao was his 2nd son. S.V.Narayanaswamy Rao was married to Narasamma in the year 1953. Narayanaswamy Rao has 4 sons & 1 daughter. S.N.Varadaraj was born in the year 1964 & married Geetha Varadaraj in the year 1996. Abhijith Varadaraj S was born to them in the year 1996. May Vashista Gotra continue & shine forever!! !